Every quarter, Field Notes produces a limited edition run of their popular pocket-sized notebooks, and each time they attempt to do something creative, impressive, or just plain interesting. 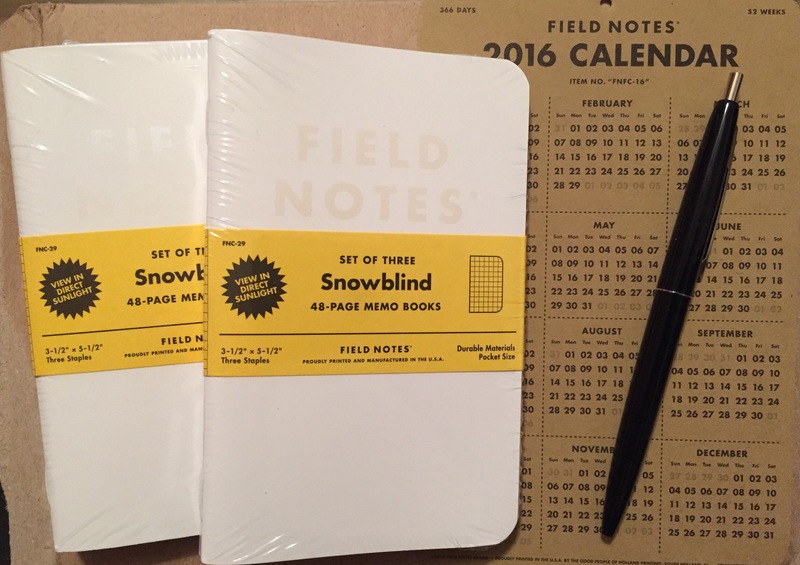 With the latest, the Winter 2015 edition, Field Notes managed to hit all those notes with their Snowblind notebooks. The catch: you need a little sunshine. The cover desing – a glittery-white text on a “silk white” background – is supposed to resemble the color palette of a snowstorm. Bring out the notebook into sunlight, however, and thanks to photochromic ink, the white cover turns to a light, powdery blue. The chemical reaction in the ink only occurs with ultra-violet light, so your typical indoor light source wont work. But when you do take the notebook out into the sun, the color-change happens surprisingly quick. Step back in the shade, and the color will slowly fade back into its original white. Obviously, anyone who spends more time outdoors will get a much bigger kick out of this Snowblind edition. Personally, I never got to see this color change very often, as my notebook spends most of its time in my back pocket. The dreary weather in my part of the country hasn’t helped either, so I’ve considered saving one of these notebooks for the summer when there is more sun to be had. Then again, maybe the rarity of seeing the color change is the point. When it happens, it feels special. After a while it could start feeling gimmicky. For now, at least, it’s one of my favorite Field Notes editions. 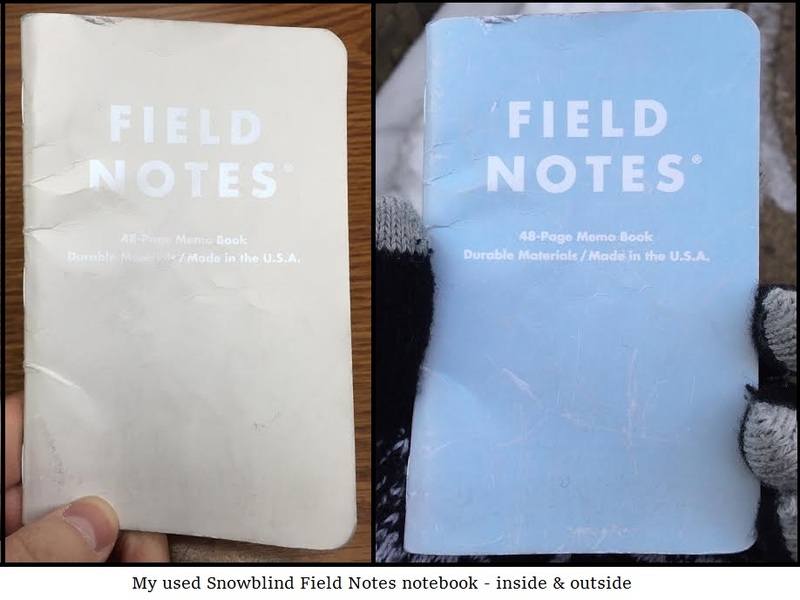 The Snowblind edition is the standard 3.5 x 5.5 inch Field Notes size with 60# grid paper and white staples (I like that attention to detail). It is number #29 of their quarterly (“color”) limited releases. Of the 30 “practical applications” listed on the inside back cover, my favorites are (#10.) Wassail Recipes, (#15.) Yeti Sightings, and (#20.) Polar Bear Plunges Plunged. Check out this Instagram picture (by Jinnie at Three Staples). It goes to show, you can really have some fun with the color-changing cover. 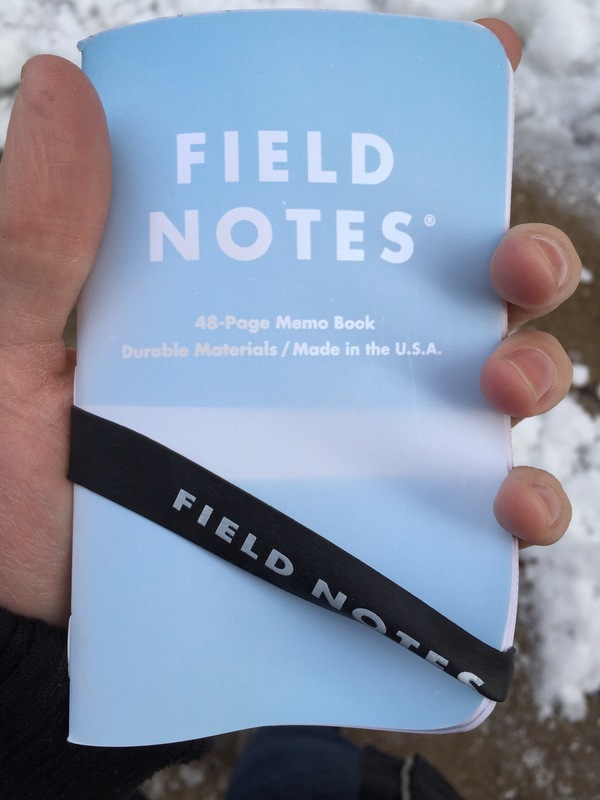 The way I view Field Notes is… ok, so the most important thing about Field Notes that no one ever mentions is that the special editions don’t cost anything extra. From that, my conclusion is that Field Notes’ shtick is creating short term, thin, disposable pocket notebooks that are durable enough to last as long as you’re likely to actually use them, and then making sure that they cycle some variety into the system every few months so that when you need to buy new pocket notebooks, you stick with their brand instead of branching out just for the sake of variety. And I’m actually really cool with that. I see it as a simple, very effective, very enjoyable, and not at all exploitative business model. I do, in fact, use notebooks of that type, and the fact that Field Notes gives out a variety of notebooks that constantly change keeps me coming back to them when I run out. If they charged extra for the “limited editions” I would probably skip them over or consider experimenting with different brand pocket notebooks, but they don’t, so the limited editions feel like random bonus fun included with something I would have purchased anyway. Lately there have been a couple of extra special editions that cost more from Nixon and LandLand. Still, at 5 dollars more, I was fine with it. However, I can’t bring myself to pay the extraordinary prices that you’ll often find on eBay. I like to use Field Notes for disposable info. it doesn’t work as a reference book for me. I actually like to collect old used notebooks, so I like the way that Field Notes tries to mirror that. And yes, I did get the Snowblind ones, one for me and one for my stepson’s Christmas present. And… if you are on the mailing list, there is a time in the Fall when you get a free pack of notebooks for buying anything. I always pick up something and it builds up my stash.